The Merseysiders are still due one more payment for the Uruguayan, with the latest release from Football Leaks confirming him as the fourth most expensive player ever. The exact fee Barcelona paid Liverpool for Luis Suarez has been leaked by whistle-blowing websiteFootball Leaks, with the Catalan club set to pay the final installment in July. The transfer documents from deals involving the likes of Gareth Bale, Mesut Ozil and Anthony Martial have all been released by Football Leaks over the past months, and now they have turned their spotlight on Suarez’s move to Barca. 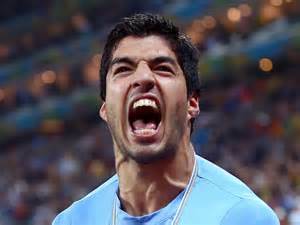 The Uruguay international made the switch to Camp Nou in 2014, shortly after causing huge controversy for biting Italian defender Giorgio Chiellini at the World Cup. The leaked documents suggest Liverpool were keen to offload the hot-headed forward as quickly as possible after that episode, as, unlike in the vast majority of deals, there were no clauses included (such as a sell-on fee or additional payment should Barca win the Champions League). Instead there was a flat fee of £64.98 million (€82.3m) for the 29-year-old, who at the time was banned for football for four months, which was payable over five instalments. Each payment was worth around £13m, beginning in the summer he was sold, and Barcelona will finally finish paying for the prolific frontman on July 31, 2016. The leaked fee confirms Suarez as the fourth most expensive player in history, narrowly behind Barca team-mate Neymar and Real Madrid GalacticosCristiano Ronaldo and Gareth Bale. Suarez enjoyed a hugely successful maiden campaign with Barca, winning the treble, and has already scored 68 goals in just 86 appearances in all competitions – a cool £955k per goal. The Football Leaks website is currently being investigated by Portuguese authorities following claims of blackmail by Doyen Sports, though the site denies any wrongdoing.